i'm so excited! I can't wait! I also love that I can tell it's my sister by the way she is holder her hands - isn't that funny. stop the cuteness! LOVE it! can't wait to see more of them! LOVE! Where do we buy? I really want to check these out. And the photos of the baby girl below are so beautiful, my favorite is the one with her hooded sweater, and I love all the color. OMG, this is just too adorable, I totally would love to have one! You did a fantastic job, I love the colors! oh I really like this! Looks straight out of a magazine! oh gosh.. i'm in love with your combo of fabrics. Can't wait to see more. Anna you are an exceptional photographer with a keen eye for design. You could be charging much more for your time, ie. session fee rates. I am a photographer who looks at many blogs and sites and you, like some others have a great talent, you should charge for it! do you ever stop???? hope your feeling better!! I would definitely buy that if it were a dress. Hey Sis. Good job on this shoots...I know it was harder, but I really like this one. You're just so amazing. I'm looking at this shot just grinning from ear to ear. You nailed it girl! all the thanks go to you, rebecca - THANK YOU - that was so fun! So adorable! Don't forget to make red and white polka dot ones! 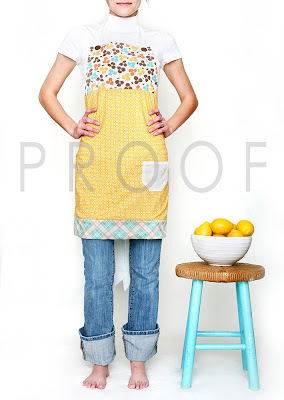 Seems like aprons are the thing right now. I have 2 other friends making them and selling them. Wish I had a stinking sewing machine (mine broke!!!) Love em! can't wait to see the ones you make!